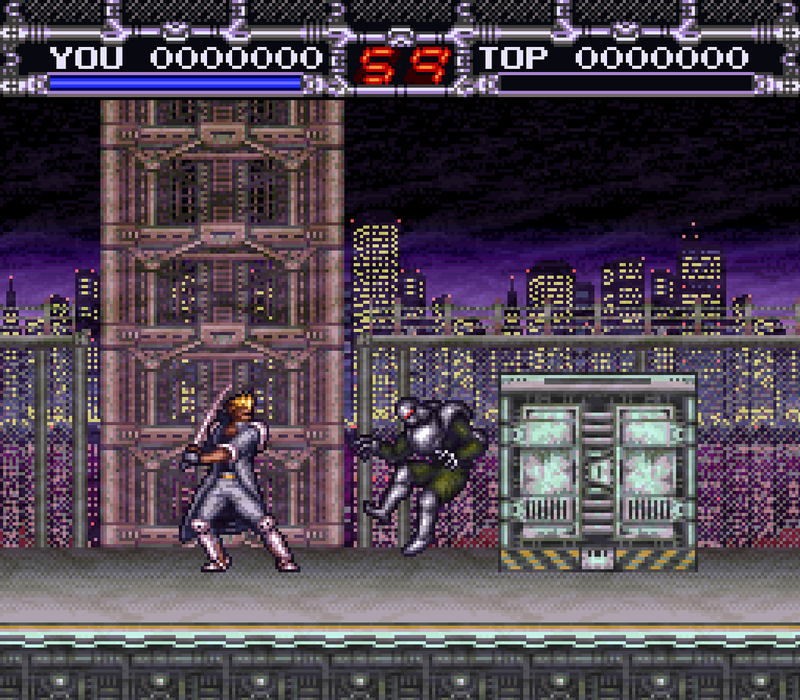 X-Kaliber 2097 was one of few SNES games I owned that began with the letter X. “So what?” you might ask. Well if you’ve read any of my other reviews, you may remember that the Cartridge Club has an Alphabet Backlog Challenge – and I was struggling with this particular letter. A few NES games fit the bill, but I really wanted to round off the year with another 16-bit gem. This one checked all the boxes. The year is…you guessed it…2097! A crime-ridden Neo New York is run by a powerful warlord named Raptor, and in true SNES fashion, only two people stand in the way of the entire global crime syndicate – a man named Slash and a woman named Alix. Naturally, you’d think you’d get the choice to select your character; though sadly the ‘damsel in distress’ cliché is used yet again. Slash is the only playable character. And with the help of his trusty sword, X-Kaliber, it’s up to him to take out the mutant shapeshifters known as Morphs, and bring an end to the evils that plague the streets. Your run-of-the-mill, cyberpunk story, but I always enjoy a good dystopian future. The game fares your standard action-platformer tropes, as you traverse through cityscapes and futuristic facilities. The 6 stages are creative, though often times unfair. The enemies are satisfying to kill, but cheap beyond reason. 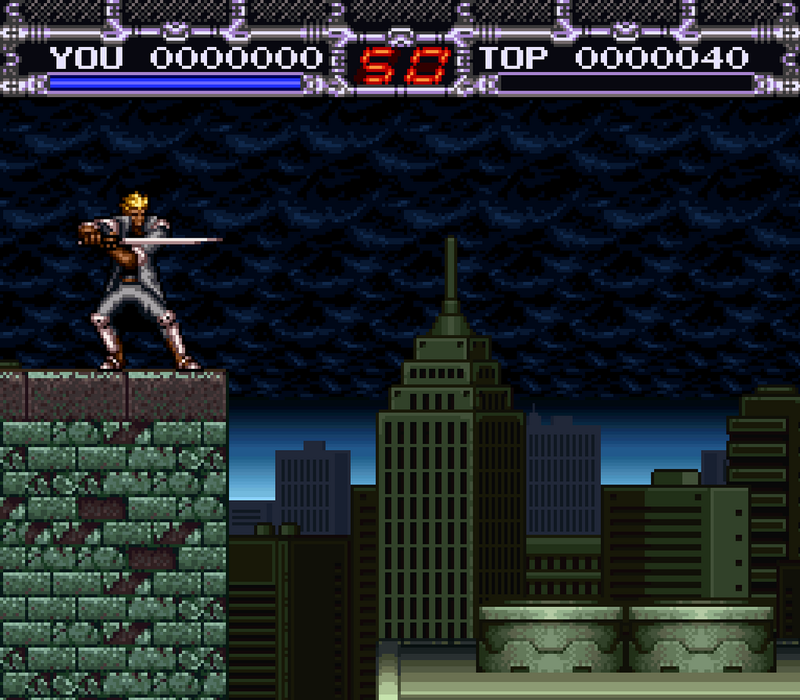 And the boss battles add an interesting flair, with one-on-one duels akin to a 16-bit fighting game. Every boss is more difficult than the last, and each is incredibly proficient in their swordplay. The number of blocks and parries had me literally beating feathers out of my couch pillow in frustration. Skill and patience are key, and I ran low on both many times! But practice makes perfect – and I eventually triumphed. Graphically, the game shines. Like a 90’s anime on your Super Nintendo. And with a Japanese release name of Sword Maniac, it’s easy to see the influence. 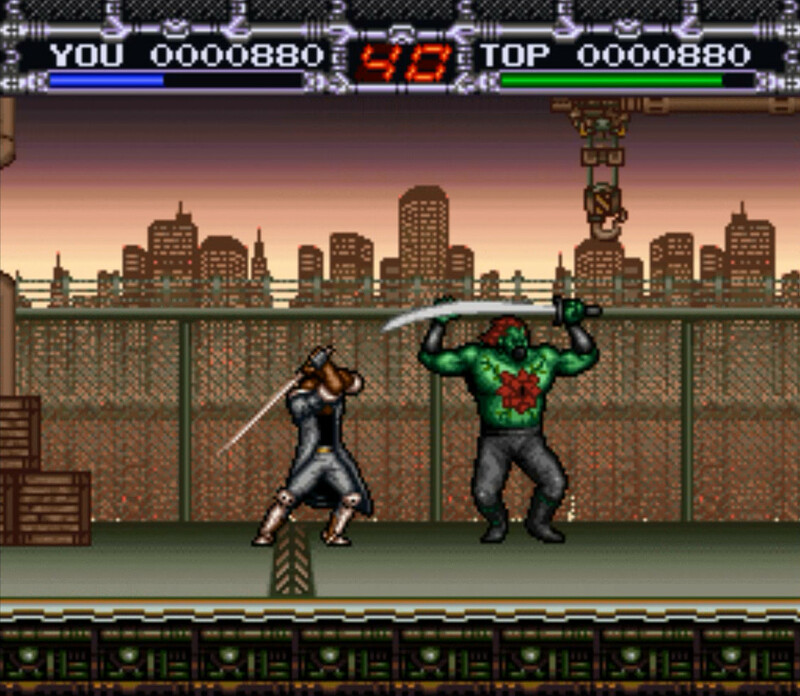 Large sprites, artful backgrounds, and each scene inter-spliced with Ninja Gaiden-esque cutscenes progressing the story and introducing characters. I like this in games. It hits both story and graphics in a nice way. The otaku in me desperately wants to see this spin-off into an OVA. Though the realist in me sees this humble title as a one-off experience that’ll likely never see a new addition to its lore. Now let’s talk about the music. X-Kaliber has put a lot of eggs in the proverbial “soundtrack basket”, and thankfully it really shines at the hands of electronic/industrial music group, Psykosonik. The upbeat, aggrotech tunes (a la Mortal Kombat) made traversing the dilapidated streets even more enjoyable for me; and it’s clear Activision knew that. 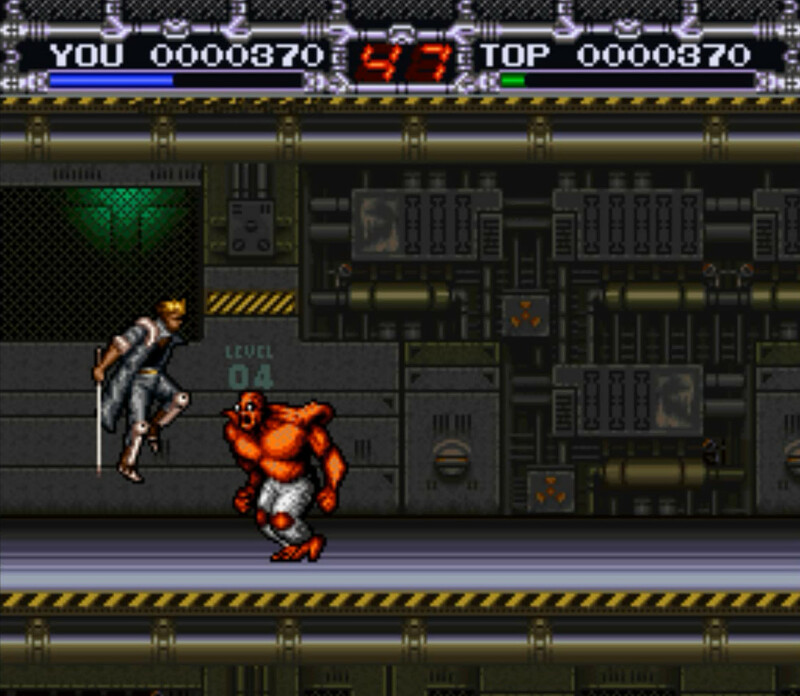 The band was used as a selling feature in the games real-life marketing, and is littered throughout the game’s environment as well; even going as far as to have a boss battle’s backdrop be a bunch of Psykosonik televisions. Whether warranted or not, there’s no denying the tunes are catchy. Just see for yourself! This game is hard. Really hard. But it’s fun and you always feel like you’re progressing. Getting better. Slowly. If you’re looking for a Super Nintendo game to get your palms sweating and blood-pressure rising, while still enjoying a good story, look no further than X-Kaliber 2097. And as always, once you’ve tried it out, be sure to head on over to the Cartridge Club forums to share your thoughts!